As district week came to an end yesterday, we saw yet another district meet go down to the wire. Once again, we saw a tie as teams battled out to continue their seasons. Unfortunately, in the end, we also saw the seasons for even more of some awesome squads come to an end, including some that we are used to seeing at the state meet. District 19-6A is a very tough district with some good teams. Last year, Katy and Katy Cinco Ranch girls squads represented the district at the state meet and the Katy and the Katy Tompkins boys teams represented the district at the state meet. In the boys race, Tompkins was running for a title defense. When the race started everyone was gunning for the number one spot and as the race progressed, it was increasingly clear that the race was going to come down to the wire. Once again this week, another team race coming down to the sixth runner. Tompkins gets the win over Seven Lakes as their fifth runner came in 20th and Seven Lakes' fifth runner finished in 28th place. Figueroa said, "It feels great, we put in all of the hard work this past summer. It was difficult, but we put it all together." Strake Jesuit gets the third qualifying spot to advance to regionals with their third place team finish. On the girls side, the team race was once again a battle from the start. Cinco Ranch freshman Heidi Nielson and Tompkins senior Alyssa Balandran were at the front as the pace setters for the race. Not too far behind them was the chase pack that consisted of the top four teams. 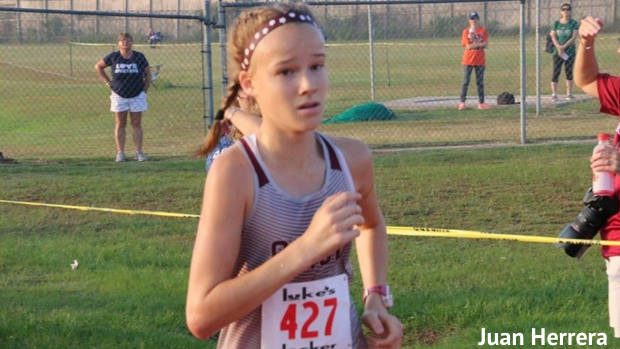 All eyes were on the pack as runners from both Cinco Ranch and Tompkins were finding their positions, but so were Katy and Seven Lakes runners. Through the first mile, it looked like Cinco Ranch was in a solid place with Tompkins and Katy runners solidly intermingled in the pack. Seven Lakes runners were solid and were still in good position, but as the race began to progress, it was clear this was going to be a two team race between Cinco Ranch and Tompkins. Individually, what began as a two person race eventually became all about Nielson. The freshman pulled further and further away as the race went a long. "I pretty much took the lead at the beginning, I tried to keep my paces even and I was trying to get under 18:00", said Nielson. As she was running all alone, the goal was pretty much for her was to keep the intensity and not let up. "It's kind of hard to keep telling myself to push when I know I have a lead, but I train myself to keep going hard." As Nielson pulled away from the field, Tompkins began to do the same way in the team race. After Nielson crossed the finish line, Tompkins' two freshmen Hayden Gold and Lauren Titus both finished in 18:59 for second and third to make it a 1,2,3 finish for freshman, in the district. They were followed by a couple of runners from Morton Ranch, Katy, and Cinco Ranch, but then Balandran finished. After a couple of more runners from the other teams came in, Tompkins closed the door as their four, five, and six runners all crossed the line in 11th - 13th. All three of those runners were also freshmen. That would seal the deal for Tompkins to win the girl's team titles as their final score was 36 points followed by Katy with 63 and Cinco Ranch grabbed the third and final regional qualifying spot with 81 points. The future looks bright for Tompkins as the boys repeated and they also added the JV and freshman boys district titles. The girls won their first ever district title and they had six freshman in their top seven. They will need to rely on those young runners and ride the momentum from this year's success because this is a very tough district. With the level of coaching and the big time programs in the district, you can't turn your back or develop a feeling of security with the other teams in this district. They'll need every advantage they can get to stay at the top of this mighty district.